Data are presented as mean±sd, n (%) or median (interquartile range). 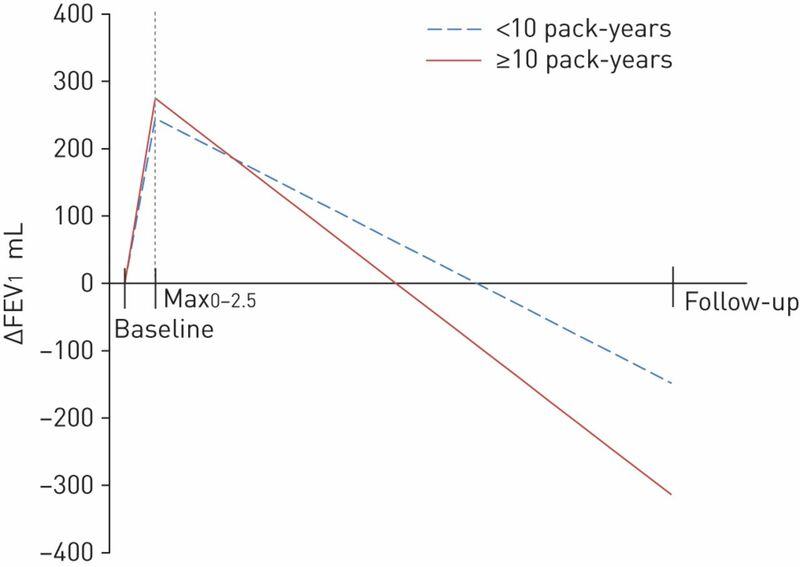 Max0–2.5: point of highest lung function (forced expiratory volume in 1 s (FEV1) % pred) during the first 2.5 years after baseline; BMI: body mass index; DL: diffusing capacity of the lung; VA: alveolar volume; ICS: inhaled corticosteroids; FVC: forced vital capacity. #: ex- and current smokers; ¶: as defined by positive skin-prick test towards common aeroallergen. Data are presented as n or median (interquartile range), unless otherwise stated. Max0–2.5: point of highest lung function (forced expiratory volume in 1 s (FEV1) % pred) during the first 2.5 years after baseline; FVC: forced vital capacity. Data are presented as n or median (interquartile range), unless otherwise stated. FEV1: forced expiratory volume in 1 s; FVC: forced vital capacity. #: statistically significant at p<0.05. Max0–2.5: point of highest lung function (FEV1 % pred) during the first 2.5 years after baseline; BMI: body mass index; ICS: inhaled corticosteroids; FeNO: exhaled nitric oxide fraction. #: pre-bronchodilator values; ¶: statistically significant at p<0.05.